Let’s think even bigger. 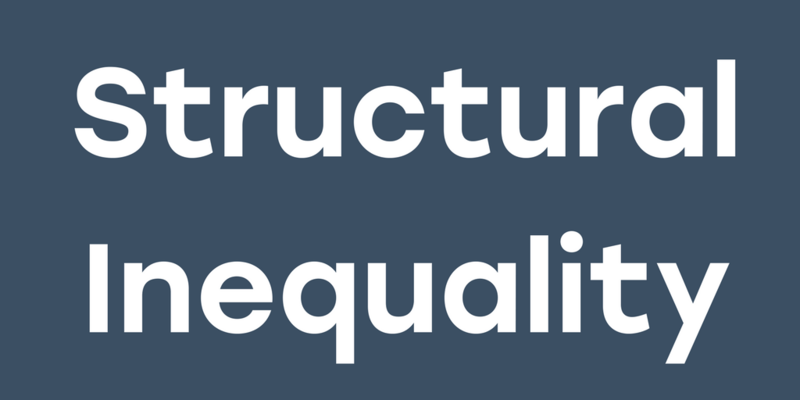 Structural inequality is when institutions work together to create a system that oppresses specific identities or classes of people, creating structural barriers to equality and mobility. It reinforces different social issues like racism and poverty. It’s complicated...but let’s break it down. First, we need to understand which structures we’re talking about. A good starting point is to think about institutions like the government, criminal justice system, religion, education, health care, media, and housing, just to name a few. Your identity most likely affects how you feel about an institution. For example, thinking about a bank will make a rich person feel neutral or safe, whereas it may make a person with less money feel anxious or scared. Want to know how inequality is making you and everyone else unhappy? So what does this mean in your life? Take a deep breath and remember that structural inequality is so deeply entrenched that it can be hard to see, let alone understand or apply. Raj Chetty is the leading economic whiz kid of social mobility. Maybe you’ve heard of the American Dream—it’s the idea that if you work hard enough, you’ll do well. Raj thinks the American Dream has packed its bags and moved to Canada. Want to know why?